Do probiotics help infantile colic? In a systematic review, Lactobacillus reuteri was effective for treatment of colic in breastfed infants. Despite the potential for probiotics to be safe and effective for treatment and prevention of infant colic, studies have been inconsistent. Researchers performed a rigorous systematic review of English-language randomized-controlled trials of probiotics in infants younger than 3 months, pregnant women in the month before delivery, or both. The 12 studies meeting criteria included 1825 infants and were published in 2006–2013. Only two studies had low risk for bias (based on randomization, blinding, and baseline characteristics). Only two (of 7) preventive trials (often with formula) showed significant reductions in mean daily crying time with probiotics compared with placebo. Three of five treatment studies in infants with diagnosed colic demonstrated probiotic effectiveness, and were sufficiently homogeneous in population (term exclusively breast-fed infants), treatment (Lactobacillus reuteri alone at 109 cfu/day), and outcome measures (crying time on day 21 as recorded by diary) to allow meta-analysis: L. reuteri significantly reduced median daily crying time by 1 hour per day (from ≥2 to ≥1 hour/day) compared with control. Notably, breast-feeding mothers in two of these studies were on dairy-free diets. No adverse effects were reported in any of the 12 trials. As with most studies of probiotics, trials of the prevention and treatment of infant colic lack standardization. The probiotic strain, dose, and infant characteristics can make a difference in results. Trials in this review with the most significant findings involved L. reuteri in breast-fed infants with diagnosed colic. Given its safety, this probiotic is worth trying when a breast-fed infant’s colic is distressing to caregivers despite conservative measures. Stay tuned, because the evidence base for probiotic use in colic is still evolving. Cornelius W. Van Niel, MD reviewing Sung V et al. JAMA Pediatr 2013 Oct 7. NEJM Journal Watch is produced by NEJM Group, a division of the Massachusetts Medical Society. Copyright ©2013 Massachusetts Medical Society. All rights reserved. This entry was posted in Uncategorized on November 27, 2013 by tfiesinger. Do group visits lower hemoglobin A1C levels in diabetic patients? BACKGROUND: Group medical visits, whereby health care professionals meet with groups of patients who have the same disease, have been introduced in primary care as a way to meet the increasing demand for health care delivery to patients with chronic diseases. We performed a systematic review and meta-analysis of the evidence on the effectiveness of such visits for patients with diabetes. METHODS: We conducted a systematic review of all relevant studies published from 1947 to February 2012 identified in a search of electronic databases and grey literature. We included randomized controlled trials (RCTs) and observational studies published in English that included patients aged 16-80 years with type 1 or 2 diabetes and that had group medical visits as the intervention. These studies were assessed for methodologic quality. We included data only from the RCTs in the meta-analysis. RESULTS: Of the 94 studies identified, we selected 26 that met our inclusion criteria, 13 of which were RCTs. Group medical visits had a positive effect on clinical and patient-reported outcomes, with significant reductions in glycated hemoglobin (HbA1c reduction -0.46%, 95% confidence interval -0.80% to -0.31%). We were unable to assess the effect of group medical visits on processes of care because of an insufficient number of RCTs that reported on this outcome. INTERPRETATION: Group medical visits for patients with diabetes were found to be effective in terms of reducing HbA1c. The results of our meta-analysis suggest that wider implementation of group medical visits for patients with diabetes will have a positive effect on patient outcomes. That is not what the *cough* body of literature says. Not at all. 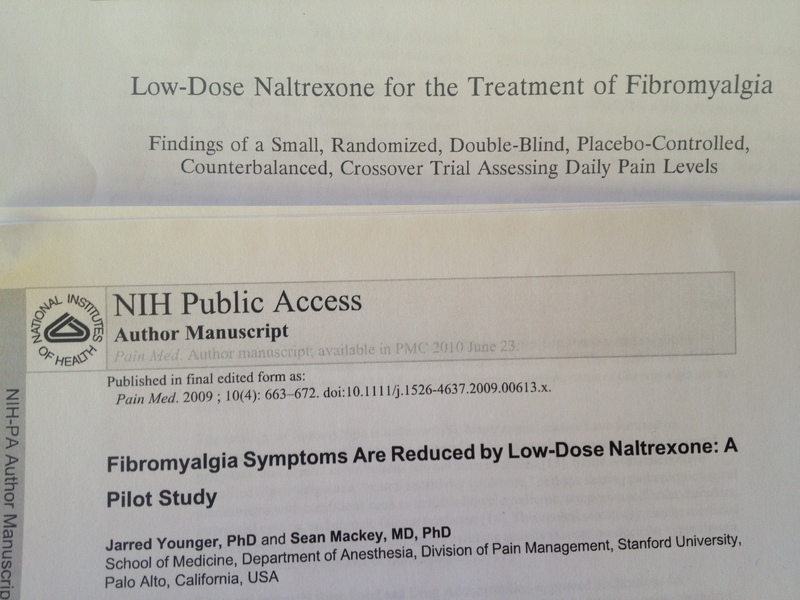 Actually, to be honest there isn’t even a body of literature there are two clinical trials looking at low-dose naltrexone and fibromyalgia (both from the same researcher). One is a single-blind cross-over study comparing 4.5 mg of naltrexone with placebo completed by 10 patients and the other is a double-blinded cross-over trial of the same dose completed by 28 patients. In both studies there was about a 32% response rate meaning about one-third of the patients taking low-dose naltrexone felt improved. Interestingly, in these studies the placebo response rates were 11% and 18%, which is much lower than expected. In a recent double-blinded study of pregabalin for fibromyalgia the placebo response rate was 27%, far more typical for fibromyalgia studies. The 32% response rate of the two low-dose naltrexone studies does look less impressive when compared against a more typical placebo response rate of 27%. Two studies with a total of 38 patients does not make a therapy standard of care, it makes it highly experimental. Given the low placebo response rate in the studies there are definite questions regarding the methodology or the possibility that naltrexone has side effects that make blinding a challenge. Or both. There are some potentially interesting ideas behind naltrexone for fibromyalgia, but there are lots of interesting ideas that simply don’t hold up to the scientific method. That is, of course, why we need more than 2 small studies with possible flaws to say that any treatment is worth while trying, never mind saying that is the standard of care. And sites like Medscape, that are read by physicians and patients alike, should be more careful about headlines that spout “proof” based on such a paucity of data. This entry was posted in Uncategorized on November 25, 2013 by tfiesinger. Is use of inhaled corticosteroids and long acting beta-agonists together for stable COPD safe and effective? BACKGROUND: Both long-acting beta2-agonists (LABA) and inhaled corticosteroids (ICS) have been recommended in guidelines for the treatment of chronic obstructive pulmonary disease (COPD). Their coadministration in a combination inhaler may facilitate adherence to medication regimens and improve efficacy. OBJECTIVES: To determine the efficacy and safety of combined ICS and LABA for stable COPD in comparison with placebo. SEARCH METHODS: We searched the Cochrane Airways Group Specialised Register of trials, reference lists of included studies and manufacturers` trial registries. The date of the most recent search was June 2013. SELECTION CRITERIA: We included randomized and double-blind studies of at least four weeks` duration. Eligible studies compared combined ICS and LABA preparations with placebo. DATA COLLECTION AND ANALYSIS:Two review authors independently assessed study risk of bias and extracted data. Dichotomous data were analysed as fixed-effect odds ratios (OR) or rate ratios (RR) with 95% confidence intervals (95% CI), and continuous data as mean differences with 95% confidence intervals. MAIN RESULTS: Nineteen studies met the inclusion criteria (with 10,400 participants randomly assigned, lasting between 4 and 156 weeks, mean 42 weeks). Studies used three different combined preparations (fluticasone / salmeterol, budesonide/formoterol or mometasone / formoterol). The studies were generally at low risk of bias for blinding but at unclear or high risk for attrition bias because of participant dropouts. Compared with placebo, both fluticasone/salmeterol and budesonide/formoterol reduced the rate of exacerbations. Mometasone / formoterol reduced the number of participants experiencing one or more exacerbation. Pooled analysis of the combined therapies indicated that exacerbations were less frequent when compared with placebo (Rate Ratio 0.73; 95% CI 0.69 to 0.78, 7 studies, 7495 participants); the quality of this evidence when GRADE criteria were applied was rated as moderate. Participants included in these trials had on average one or two exacerbations per year, which means that treatment with combined therapy would lead to a reduction of one exacerbation every two to four years in these individuals. An overall reduction in mortality was seen, but this outcome was dominated by the results of one study (TORCH) of fluticasone/salmeterol. Generally, deaths in the smaller, shorter studies were too few to contribute to the overall estimate. Further longer studies on budesonide/formoterol and mometasone / formoterol are required to clarify whether this is seen more widely. When a baseline risk of death of 15.2% from the placebo arm of TORCH was used, the three-year number needed to treat for an additional beneficial outcome (NNTB) with fluticasone / salmeterol to prevent one extra death was 42 (95% CI 24 to 775). All three combined treatments led to statistically significant improvement in health status measurements, although the mean differences observed are relatively small in relation to the minimum clinically important difference. Furthermore, symptoms and lung function assessments favored combined treatments. An increase in the risk of pneumonia was noted with combined inhalers compared with placebo treatment (OR 1.62, 95% CI 1.36 to 1.94), and the quality of this evidence was rated as moderate, but no dose effect was seen. The three-year NNTH for one extra case of pneumonia was 17, based on a 12.3% risk of pneumonia in the placebo arm of TORCH. Fewer participants withdrew from the combined treatment arms for adverse events or lack of efficacy. AUTHORS’ CONCLUSIONS: Combined inhaler therapy led to around a quarter fewer COPD exacerbations than were seen with placebo. A significant reduction in all-cause mortality was noted, but this outcome was dominated by one trial (TORCH), emphasizing the need for further trials of longer duration. Increased risk of pneumonia is a concern; however, this did not translate into increased exacerbations, hospitalizations or deaths. Current evidence does not suggest any major differences between inhalers in terms of effects, but nor is the evidence strong enough to demonstrate that all are equivalent. To permit firmer conclusions about the effects of combined therapy, more data are needed, particularly in relation to the profile of adverse events and benefits in relation to different formulations and doses of inhaled ICS. Head-to-head comparisons are necessary to determine whether one combined inhaler is better than the others. This entry was posted in Uncategorized on November 22, 2013 by tfiesinger. This entry was posted in coronary artery disease on November 22, 2013 by tfiesinger. Do controversial and conflicting recommendations change mammography screening rates? Pace LE, He Y, Keating NL. Trends in mammography screening rates after publication of the 2009 US Preventive Services Task Force recommendations. Cancer 2013;119(14):2518-2523. In 2009 the USPSTF updated its recommendations for breast cancer screening, which were met with great controversy, a media firestorm, and other organizations issuing (or re-iterating) different recommendations. Recall that the Task Force’s mandate from Congress is to tell us what we know about screening and prevention, tell us what we don’t know, and do not speculate. To do this, they work with evidence-based practice centers who do high-quality systematic reviews to guide their recommendations. In essence, the Task Force is akin to meteorologists who report — not make — the weather. However, other organizations are allowed to speculate. So, the authors of this study decided to look at National Health Interview Survey (NHIS) data from 2005, 2008, and 2011. They identified nearly 28,000 women 40 years or older. The authors used the women’s self-report of having had a mammogram to estimate screening rates. They also collected data on other factors that might influence screening rates (eg, immigration status, socioeconomic status, race, and so forth). The crude screening rate in 2011 was actually higher (54%; P = .03) than in 2008 (52%) or 2005 (50%)! After taking into account race, income, education level, insurance, and immigration status, the difference was no longer significant. In particular, the screening rate among women between 40 and 49 years of age, the group stirring the greatest controversy, was also no different. Please note that the way the NHIS assessed mammography was slightly different in 2011 than in other years. The 2011 survey directly asked if a woman had a mammogram in the previous 12 months; the previous surveys used a more circuitous approach to the answer, requiring 2 or 3 questions. This entry was posted in Uncategorized on November 18, 2013 by tfiesinger. Patients who presented with spontaneous intracranial hemorrhage within the previous 6 hours were randomly assigned, using concealed allocation, to receive intensive BP-lowering therapy (n = 1403) or standard BP management according to current guidelines (n = 1436). Patients with structural causes for the bleed, those who were in a deep coma, or those who required early hematoma evacuation were excluded. In the intensive treatment group, intravenous and oral BP medications were used to lower the systolic BP to less than 140 mm Hg within 1 hour and maintain it at this level for 1 week. Those in the standard treatment group received BP-lowering agents only if their systolic BP was greater than 180 mm Hg. The mean age of the patients in the 2 groups was 64 years and the median presenting Glasgow Coma Scale score was 14. As compared with the standard therapy group, the intensive treatment group started BP-lowering therapy earlier after onset of intracranial hemorrhage (4.0 hours vs 4.5 hours; P < .001) and was more likely to receive intravenous agents (90% vs 43%; P < .001). At 90 days, there was no difference in the primary outcome of death or major disability, defined as a score of 3 to 5 on the modified Rankin scale (0 to 6, where 0 indicates no symptoms and 6 indicates death). Overall, 12% of the patients in each group died. When looking at disability alone, the intensive treatment group had significantly lower modified Rankin scores than the standard therapy group (odds ratio = 0.87; 95% CI, 0.77-1.0; P = .04) and had higher health-related quality of life scores (0.60 vs 0.55; P = .002). As this trial was not masked, the possibility exists that patients in the 2 groups were managed differently beyond just the 2 BP-lowering strategies. Anderson CS, Heeley E, Huang Y, et al, for the INTERACT2 Investigators. Rapid blood-pressure lowering in patients with acute intracerebral hemorrhage. N Engl J Med 2013;368(25):2355-2365. This entry was posted in Uncategorized on November 11, 2013 by tfiesinger.